Red Killer is the first puzzle game from the TribeQuest Universe. 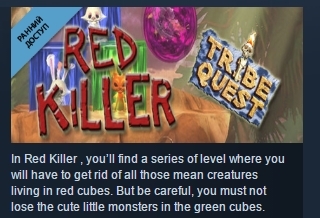 In this game, you’ll find a series of level where you will have to get rid of all those mean creatures living in red cubes. But be careful, you must not lose the cute little monsters in the green cubes. This is the first version of the game, we intend to keep on working on it a lot and make it much better. We first wanted to develop as much gameplay as we could without creating dozens of level each times. We wish to make this game bigger with the help of the players, depending of what they prefer most. So, have fun with this version of the game and tell us what you think. Buying this game now will get you all the next, more complete, versions for free.